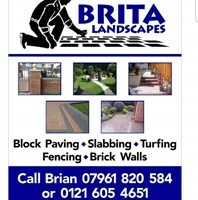 Brita Landscapes is a solo run business, with years 20 years of experience. We are a slabbing and block paving specialists, always aiming to provide a professional, honest and reliable service for all our customers. Our services include: slabbing, block paving, fencing, turfing and brickwalls. Will work in, Sutton Coldfield, Kingstanding, Erdington, Great Barr, Boldmere and Aldrigde.